Darcy’s Voyage was one of the first and best Pride and Prejudice Variations I’ve read, and one I re-read quite frequently. The plot is very different from anything I’ve ever seen in P&P variations, and the author must be praised for the originality. 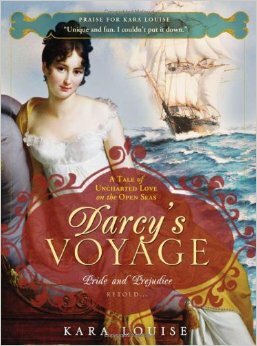 In Darcy’s Voyage, Elizabeth Bennet embarks on a ship that will take her across the ocean from the United Kingdom to America and it is on that ship that she will meet Mr. Darcy. With such a long trip ahead and nowhere to go, you can imagine how this book has a great deal of Darcy and Elizabeth scenes. I was delighted by this! The book is a bit long, but not a bit dull with all the interactions between them. It is perfect for readers who can not get enough of Darcy and Elizabeth scenes. The characters are true to themselves, their actions, temperaments, thoughts and words are so familiar to the ones Jane Austen described that we have no doubt we are reading a Pride and Prejudice inspired book. But despite this, the reader doesn’t need to have read Pride and Prejudice to fully understand and love Darcy’s Voyage, which is something I find particularly interesting considering most variations require some degree of knowledge of the story. This book stands out for itself, everything is very well written and described, the attention to details is astonishing and once again, Mrs. Louise did what in my opinion she does best: she created an unbelievably different scenario and developed a story than can be as loving and passionate as Pride and Prejudice itself. I remember I couldn’t stop reading this book the first time I read it, I wanted more and more scenes between our dear couple, and every time I revisit this book I feel the same way. It is passionate, original and I highly recommend it! I’m about to go on an adventure myself as I will be flying from the UK to the USA tomorrow. Thankfully I’ll be flying, so I won’t have to be confined in a ship for a couple of months as ELizabeth did. And I’m traveling with my husband, so I will not be meeting Mr. Darcy on my voyage either, but the coincidence made me want to go back on my memory lane, retrieve my review of the book, and share it with everyone, even if it is a very simple one. I never read a jaff story with this premise. Sounds like a great read. Another of my all time favorite books!